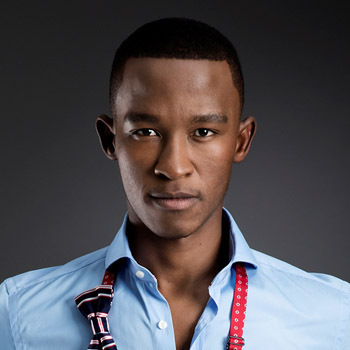 Awarded the title of Presenter- of-the-Year at the 2015 South African Film and Television Awards (SAFTAs) as well as being crowned the most stylish male celebrity in South Africa at the 2014 YOU Spectacular Awards, Katlego Maboe has grown year-on-year. He is the host of Expresso, SABC’s “Feel Good Breakfast Show” which reaches audiences all across the country and parts of Botswana, Lesotho and Swaziland and was nominated for a 2014 award for Best Variety Show at the South African Film and Television Awards. Katlego grew up in the town of Potchefstroom, completing his schooling at Potchefstroom Boys High, where he matriculated in 2004. He then graduated with a B.Com degree in Chartered Accountancy from North-West University in 2007. Katlego has been passionate about music ever since becoming a member of the North West Children’s Choir in 1998. His love for singing has manifested itself in his involvement in the well-known South African acapella boy band, Flip a Coin, as one of the group’s lead vocalists and beat-boxers. Hard working and dedicated to perfecting his crafts in a very competitive entertainment industry. One of the qualities that have led to Katlego’s success is his ability to communicate with people from all walks of life, a skill that is enhanced by the fact that he is fluent in English, Afrikaans and Setswana. He is a vibrant and goal-driven young man with a zest for life and an inexhaustible source of energy. His charismatic personality has endears him to all those who know him and he continues to steal the hearts of those around him.